â€œThe day Indian minorities say they donâ€™t need the Minority Front (MF) to protect their rights and that theyâ€™re comfortable in the new democracy then you know that weâ€™ve done our job,â€ MF leader Shameen Thakur Rajbansi said. As long as people continue to vote for the MF, it means the party is relevant, and people are still evolving and maturing in the democracy, Rajbansi said in an interview with The Daily Vox. The party fights for equal opportunities for minorities in the country. The late Amichand Rajbansi started the MF in 1994 at the advent of a democratic South Africa. Rajbansi was active in the African National Congress (ANC) Youth League since the age of 12. He first took interest in the issues affecting Indian people when the apartheid government forcibly removed Indians living in Clarewood using the Group Areas Act. When Amichand Rajbansi passed away in 2011, his widow Shameen Thakur Rajbansi took the helm. It wasnâ€™t an easy ride, the battle for leadership of the party was contested in court. Â As a result, support for the party dropped in the last two elections. Since the 2014 general election, the MF had two major demands from the government: for government to create a separate ministry and a separate minorities commission for the minorities in this country. â€œSomeone has to listen to the needs and wants of the youth,â€ Rajbansi said, and that someone is the MF. â€œMy focus for the next 10 years will be on the young people,â€ Rajbansi said. Her mission extends to grooming young leaders to go into politics or the non-governmental sector, she said. 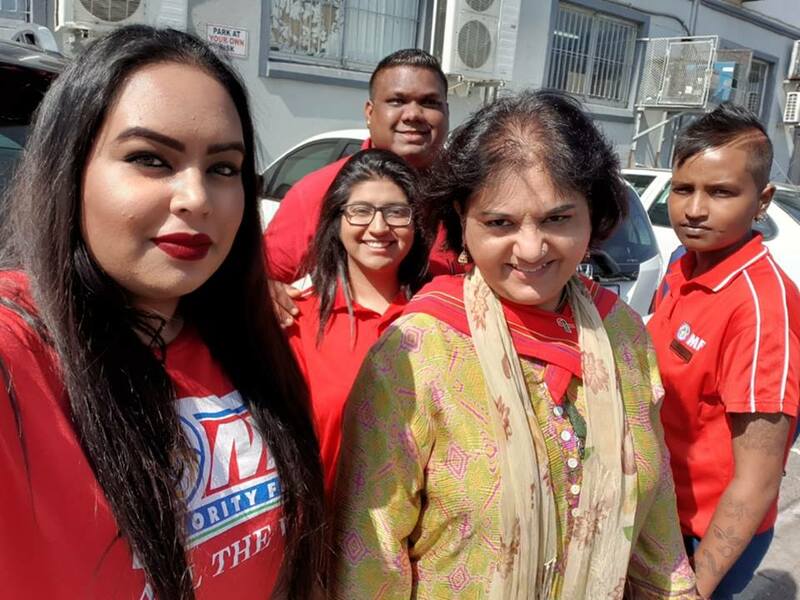 While the MF is a predominantly Indian party, Rajbansi said she connects with black youth too. â€œI also look after a lot of black youth who feel they are discriminated against or come to live in â€˜former Indianâ€™ areas,â€ she said. As a human values-based and principle-based party, the MF teaches people how to protect and build, Rajbansi said. That is a value she wants to extend to the youth. Shameena Rajbansi (center) with local youth, taken from Facebook. Political leadership should spend more time with the youth, rather than just â€œdishing out policyâ€, Rajbansi said. â€œThe youth have some fascinating ideas, we’re losing out on creativity and innovation,â€ she said. Instead, she said, political leaders mislead the youth. â€œThey train the youth to be politically rebellious so that it blinds the youth to the other potential they have,â€ Rajbansi said. On the free education debate, Rajbansi said the MF supports it but wants clear policies in place. â€œFreedom is not free, it is actually very costly. You can make education an inalienable right if you have a plan on how to funnel the budget to fund it,â€ she said. For the MF, all policies should be clear and detailed including the land policies. â€œLand expropriation is fine, you canâ€™t have landless people. But you canâ€™t just expropriate when someone has a title deed,” Rajbansi said. The MF holds that government should legislate around the amount of money they will pay for that land. â€œLand expropriation must be done with a policy and a plan,â€ Rajbansi said. The ANC should redistribute government-owned land, the MF holds. â€œGovernment has vast lots of land. I donâ€™t understand why they canâ€™t cut up the plots and give it to people who need to build homes,â€ she said. â€œTraditional leaders also have so much land, but itâ€™s in a trust. How are you going to deal with that?â€ she added. â€œGender-based violence (GBV) is about mindset,â€ Rajbansi said. The MF position on GBV is to change the behaviours of the community: to empower women, and praise men. In her public speaking at events, Rajbansi tells parents, especially mothers, to teach their boys and girls that they can do the same things, and that their sons should respect and be protective over women. Women, she said, must support each other. â€œBut it is very difficult to legislate that,â€ Rajbansi said. â€œWe canâ€™t legislate into someoneâ€™s home or bedroom because it becomes too intrusive. We canâ€™t legislate so that we become a moral policing state,â€ she added. The MF is also concerned about political leaders who abuse women, and are looking for ways to legislate around that. Rajbansi said men in politics are particularly abusive. â€œMen get very violent when we compete with them, both emotionally and physically,â€ she said. â€œYou will have women not entering politics because they are afraid,â€ Rajbansi added. A firm supporter of the LGBTQ community, Rajbansi is advocating for government to have special departments to look after the community too. Rajbansi said the leadership within the MF sets the party apart from others. â€œIf you do that research, youâ€™ll find that the MF has strong and hardworking leaders dedicated to community development. You wonâ€™t find rabble rousers in the MF, we put our money where our mouth is,â€ Rajbansi said.